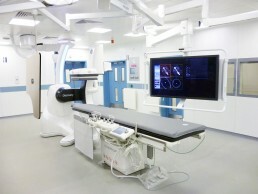 The works comprised modifications to an existing operating theatre, staff rest room and kitchen to form a new theatre suite to house a state of the art angiography system and ancillary equipment. The existing layout was remodelled to provide an adjoining equipment control room, equipment room, UPS plant room and an observation room next to the theatre to be used for training purposes. 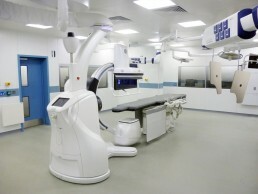 The existing anaesthetic room and scrub room were extensively refurbished. 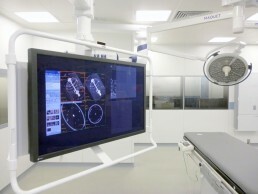 Existing partitions were replaced with new having x-ray shielding and entry doors into the theatre fitted with electronic interlocks to prevent them from being opened when x-rays are in use. 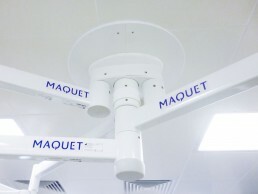 The installation of the laser guided angiography system is the first of its kind in the UK and one of only a handful worldwide. 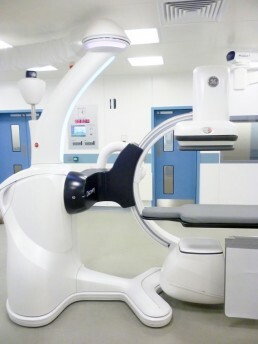 Its ability to deliver high quality imaging with its high end fluoroscopy image guidance, advanced applications and 3D image fusion means the theatre can be utilised to allow a wide range of endovascular, cardiac, hybrid and open surgical procedures.